You know it’s been cold when 40 degrees feels like 70! What a fantastic day! (I’m writing on Thursday…. looks like it might not last long.) So, I was inspired to take a tour of the top ten places in town I just can’t wait to see thawed out. 10. Frostee’s. I prefer cold in the form of ice cream, not snow. 9. This poor muddy field behind the old high school that the east side kids have to walk across to get home. 5. … the city park, although it looks like snow hasn’t stopped people from enjoying it! 1. My own house, which has been buried in snow since we bought it (or too cold to care). Why do we live where we only get to enjoy half our local amenities for half to 3/4 of the year? I guess they must be pretty good if it’s worth the wait. 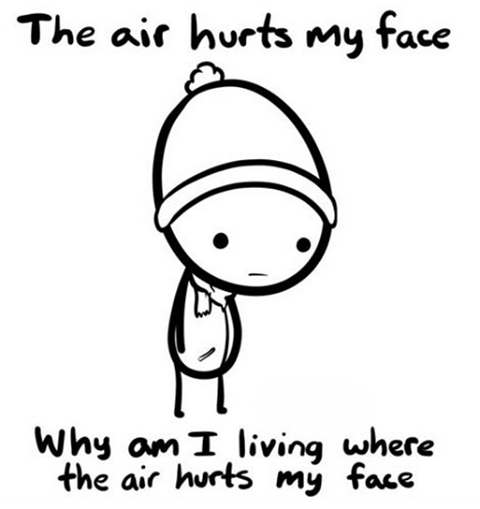 Posted by my sister in law today, who lives where it’s even colder than here.